Cardone is a flavourful vegetable that is becoming increasingly popular especially with cooks. 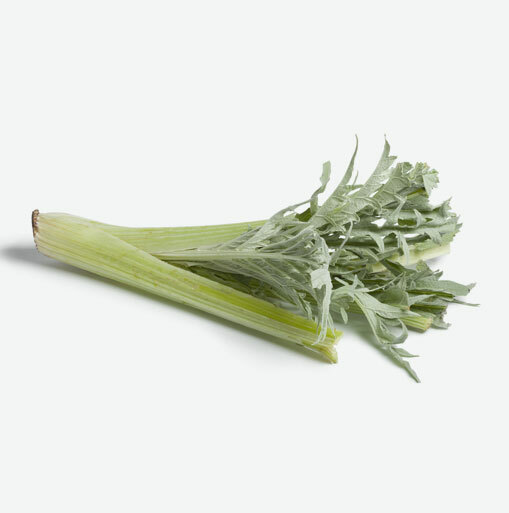 A cousin of the artichoke, cardone is known for its edible stalks much like celery, except that it cannot be eaten raw. Cardone is considered a delicacy by the Italians and the French who have revered the plant for more than 300 years. The best cardone stalks are a grey-green colour. They should feel heavy and moist, and not hard and crisp like celery. If you see some discolouration, trim these areas while preparing the cardone. The few leaves you see should be soft and pale, grey-green. When you are storing cardone, place it in the crisper section of your refrigerator wrapped in plastic. Cardone should last about five to seven days in the refrigerator. You can steam cardone stalks, simmer them in water, vegetable or chicken stock, or microwave in a small amount of water, covered, in a microwaveable bowl until tender. Check doneness by poking a slice with the tip of a knife or fork to see if it is tender. Pound and bread the cardone in egg mixture and breadcrumbs. Fry the cardone like cutlets and serve with an anchovy sauce or plain. Cardone can be made into a delicious quiche, or excellent French “gratin” casserole when simmered slices are topped with a rich cheese sauce.